General Description: The Meadowood type is a very thin, medium to large sized, broad, side notched point. The notches occur very close to the base. The blade is trianguloid in outline, flat in cross section with straight edges that can range from slightly excurvate to slightly incurvate and are occasionally serrated or deeply beveled from opposing sides. The stem is very short and is neatly side notched, sometimes with a double notch. The base is usually straight but can be slightly convex and on some examples can be expanding into a fan shape. The base is ground smooth on about fifty percent of examined specimens. Unfinished or unnotched blades are often found in caches. 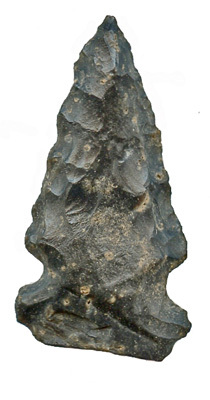 In New York, these points were typically made from a mottled gray and brown flint from the Onondaga region of western New York and the Ontario Peninsula or the clear gray flints of the central New York Onondaga escarpment. In Ohio, Upper Mercer gray flint and black varieties are common. Indiana Hornstone and Carter Cave flint are only occasionally seen as are Delaware and Logan County cherts. The size of the Meadowood point can range from 41 mm to 89 mm in length with the typical point being in the 63 mm range. The average thickness rarely exceeds 5 mm. The Meadowood point type was named by William A. Ritchie for specimens he found near Meadowood, New York.